With a population of almost 40.000, Figueres is the largest city in the county of Alt Empordd. Besides being the birthplace of the famous Salvador Dali, Figueres is the hometown of other distinguished people, such as Narcis de Monturiol, the inventor of the submarine which came to be known as "ictineu" or the fish ship. This town is the marketplace of the surrounding region mostly because of its geographical location. Being close to the French border, Figueres is one of the favorite shopping spots of French tourists, who find the diversity and quality of the city's shops very appealing. Figueres lies on the route of tourism traveling from France to the cities situated around the Gulf of Roses, and as a result has excellent communications networks and infrastructures. Just like in Barcelona, La Rambla is the commercial centre of downtown Figueres. The riverbed of Galligans was covered in order to build this wonderful promenade and a monument in homage of Narcis de Monturiol was erected at its end. The Toy Museum of Catalonia, inaugurated in 1982, is also located along La Rambla in Figueres. You and your children will be delighted admiring thousands of toys (more than 4000 items) from different ages, some of these having belonged to famous artists. The Museum of the Emporda can also be found on La Rambla housing paintings, sculptures, and archaeological collections from different ages. 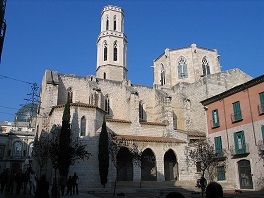 Located in the Saint Peter square, the Church with the same name is also an interesting tourist attraction in Figueres, as it dates from the 12th century. The Saint Ferdinand Castle was built in the 13th century and can be found on a small hill in the outskirts of Figures. It is thought to be one of the largest military constructions with bastions built in that period of time in Europe. The second most visited museum in Spain, after the Prado Museum in Madrid, is The Dali Theatre and Museum located in Figueres. This building is located very close to the church and used to be the Municipal Theatre. In this theatre, in 1918 Salvador Dali, among other artists, had his first ever art show and exhibited two of his paintings. In 1939, the building housing this theatre was partially damaged by the World War II. The remodeling works that would transform the venue into the Dali Theatre and Museum began in 1960. 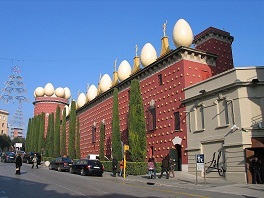 Salvador Dali, himself directed the decoration works of the building, and devoted some of his creations especially for this Figueres Museum (the Mae West Room, the Wind Palace Room, the Rainy Cadillac) . The Museum first opened for the public in 1974 and became the second museum in the world to be devoted exclusively to Salvador Dali. In 1971, in the United States of America, the Dali Museum of Cleveland, Ohio, had been founded. The Museum houses a small private collection that had belonged to the artist, but also some of his remarkable creations including paintings, sculptures, jewelry, engravings, and drawings. In 1989, Dali died and was buried in a crypt located beneath the Museum, following his own wishes.